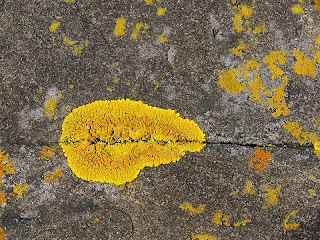 OK, I admit this first one is a lichen, but it provides some bright colouration to the rocks of the foreshore. In places it looks like someone has painted the rocks bright yellow. 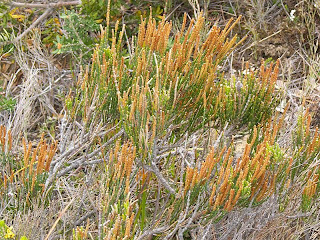 Although I've had trouble before identifying Allocasuarinas, I'm fairly sure this one is Allocasuarina monilifera, the Necklace Sheoak. 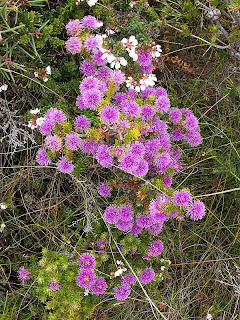 This was on the heath between Remarkable Cave and Mount Brown. 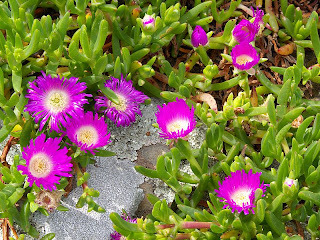 The Native Pigface, Carpobrotus rossii, adds attractive bright pink and green to the landscape. 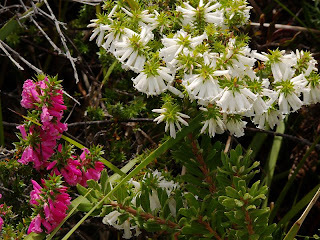 The Swamp Honeymyrtle, Melaleuca squamea, is part of the attractive heath between Remarkable Cave and Mount Brown which is flowering quite copiously at present. This one stood out, and I suspect it's a weed. I can't identify it yet anyway. The (apparent) flowers on this one were superficially similar to the previous weedy-looking plant. However the leaves were very different. 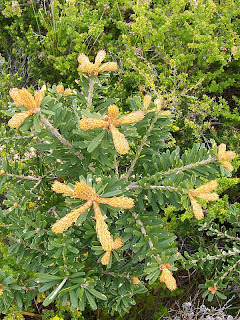 Denis Wilson noted it looked like new leaf growth on Banksia, and he's right. There was another similar one with old bottlebrushes on it. 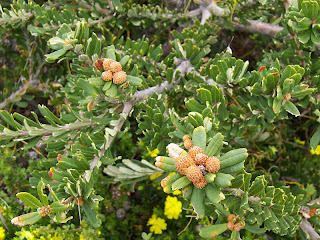 We speculated on a Banksia when we were looking at it, but we were misled by this new growth. Thanks to Denis for helping. By a very rapid process of elimination then, these are simply Banksia marginata, although seeming quite different to the tree form I have seen on mountains. No mystery at all. 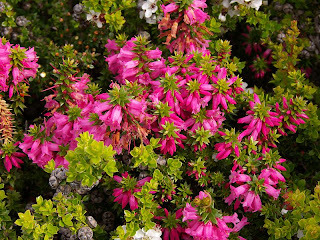 This is the Common Heath, Epacris impressa. The flower colours vary, as seen clearly. 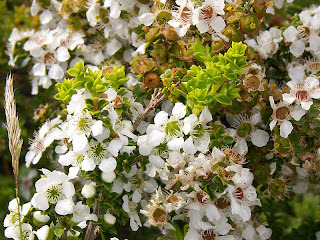 Teatree, Leptospermum scoparium. 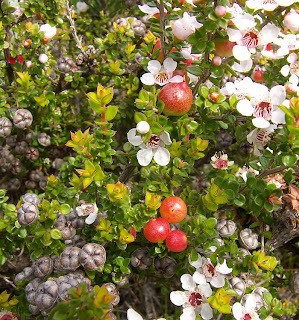 The flowers on these vary in the colour of the nectar disc. Some are green, others a deep red, but they seem to be the same plant. I'll stand corrected if I'm wrong. The last two images look to me like new growth (not flower heads) on Banksias. Thanks Denis, and a quick search on the web suggests you are quite right. We learn something every day. Now I need to work out which species. 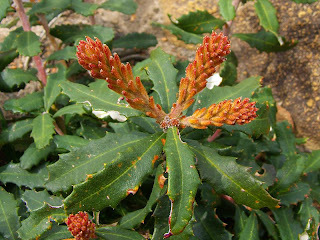 Interestingly, when I was searching for "Banksia marginata" new growth on Google Images, I found this page of yours! Which wasn't any help, but never mind. This page did help, but the identification is a little tentative. 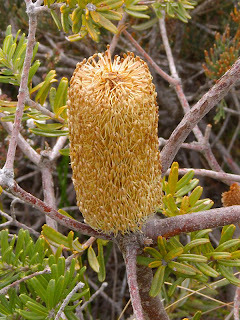 I don't recall publishing any photos of Banksia new growth - certainly not Banksia marginata. However, Google can get itself confused, sometimes. My images are not ever "labelled" - just associated with text. That makes it unreliable for image searches. Anyway, the second image you found is spot on for what I figured I was looking at. So I am really glad you persevered with the Google image search. I cannot help with species - as I am not sure what you get there. 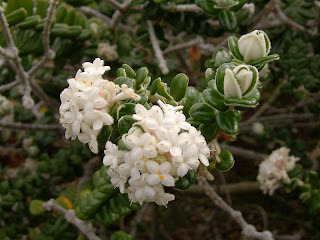 The closest I would suggest (a local one in my area) is B. paludosa - the "Swamp Banksia" - a low growing, scrubby shrub with poor flowers. But the new growth looks interesting - just like your image. 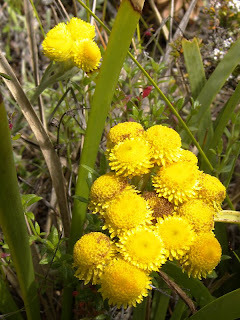 Anyway, for plants such as Banksias, which I am sure are well researched in Tassie, there will be a finite range of choices, unlike Orchids, or Mosses and Lichens and Fungi, etc. 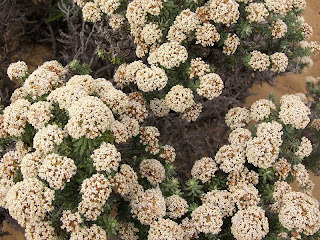 For example, NSW seems to have about 12 species, (only) - and many are very distinctive. So now you are on the right track, I am sure you will sort it out easily enough. Thanks Denis, and no offence, as I am an acknowledged very amateur botanist. Oh, and your page happened to contain the term "Banksia marginata" as well as an image - the image it picked was the picture of yourself.